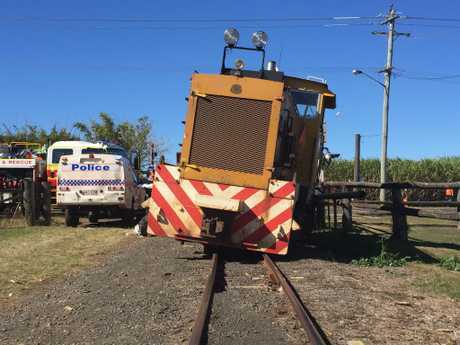 POLICE are investigating after a car and a cane train collided at a rail crossing at Qunaba late yesterday morning. The train had been towing 10 bins full of sugar cane at the time, and the impact of the crash caused the locomotive and three of the bins to derail, blocking Port Rd (Burnett Heads Rd) for several hours. 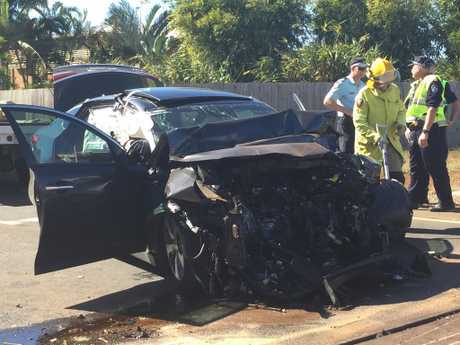 The driver, a 50-year old Burnett Heads woman was taken to Bundaberg Hospital with serious but non-life-threatening injuries after emergency services successfully pulled her out of the crumpled grey hatchback. Three people were onboard the train at the time but were not hurt, according to police. Train and car crash at Qunaba: Train and car crash at Qunaba. PORT Rd has been opened in both directions after this morning's crash. The wreck has been towed from the scene. The car was severely damaged. SENIOR Sergeant Glenn Cameron has spoken to media following the serious crash at Qunaba this morning. He said the driver who crashed into the train was taken to hospital in a stable condition. "We implore drivers to make sure they drive to conditions, especially around these areas at this time of the year when cane trains are active," he said. Sen Sgt Cameron said the lights were active and working at the time of the incident and that drivers should take caution during cane season. He called on drivers to pay attention and said the road would be open again soon as the sugar company got to work making the scene safe. A SPOKESMAN for the Queensland Ambulance Service has confirmed that a woman in her 40s has been taken to Bundaberg Hospital. He said the woman suffered a fracture and injuries to her leg, but was in a stable condition. It is understood a train driver has also been taken to hospital suffering back pain. The road at Qunaba is still blocked. 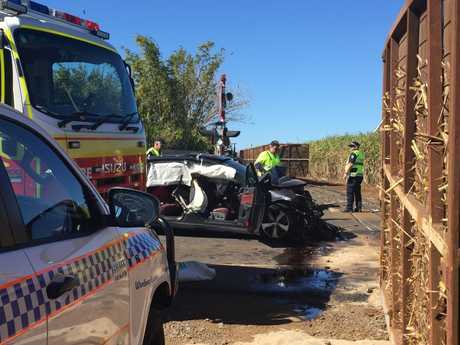 A WOMAN has been removed from a car that was involved in a crash with a cane train this morning. She is being taken to Bundaberg Hospital by ambulance. The Lifeflight rescue helicopter has also left the scene. Queensland Fire and Emergency Services units are currently working to separate the wrecked car from the cane train, still lying across Port Rd. Neighboughrs who heard and saw the crash unfold are standing nearby and police can be seen talking to a number of Canegrowers emloyees, one of them believed to be the driver of the train. Emergency crews work to free a person from a car that's crashed with a cane train. A LIFEFLIGHT rescue helicopter has landed at the scene of a car and train crash at Qnaba. 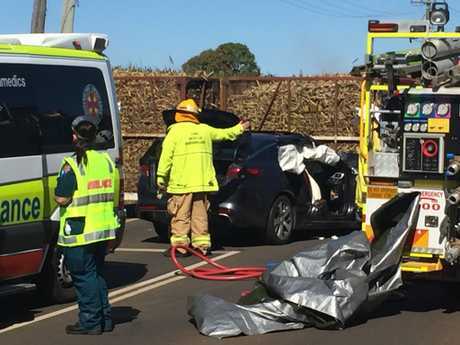 A person who watched the crash unfold told the NewsMail the lights had been flashing red when the car "just ploughed straight into (the train)". Emergency services are currently working to free the woman in her 40s from the silver hatch. Car and cane train crash: Crews work to free a person trapped in a car after it collided with a cane train. At least three police crews, two ambulances and two fire units are on scene. He said the red lights at the crossing were working and flashing as the train was moving through. The road has been blocked. Crews have removed a woman from a car following a crash with a train. A CAR and cane train have collided on the Port Rd at Qunaba. 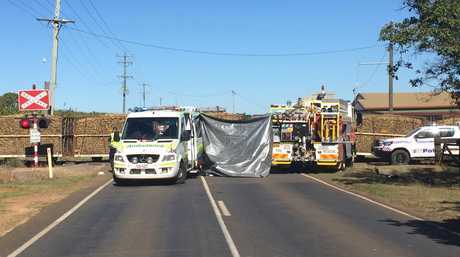 The cane train was rerailed and is blocking the 100km/h stretch of road in both directions. Emergency crews responded to reports of the crash about 11.13am and are now on the scene. They are working to make the area safe and extract the female driver from the wreck. Less than a month ago, a car and cane train collided at Alloway. While no one was badly injured, police said the incident could have easily ended in tragedy. 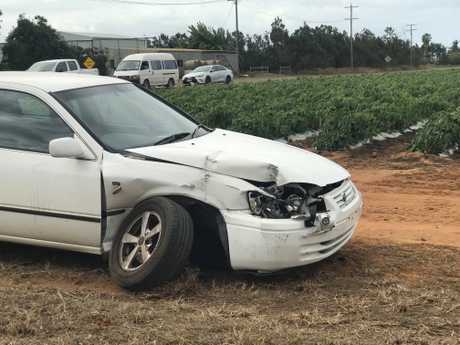 Commenting on that crash in June, Bundaberg police Sergeant Mick Ward urged all motorists to drive with caution during cane season. "You need to slow down, you need to stop, you need to look and be alert of where trains are coming from," he told the NewsMail. "Don't be the driver who gets hit by a train or who hits a train and then causes your death or somebody else's death. 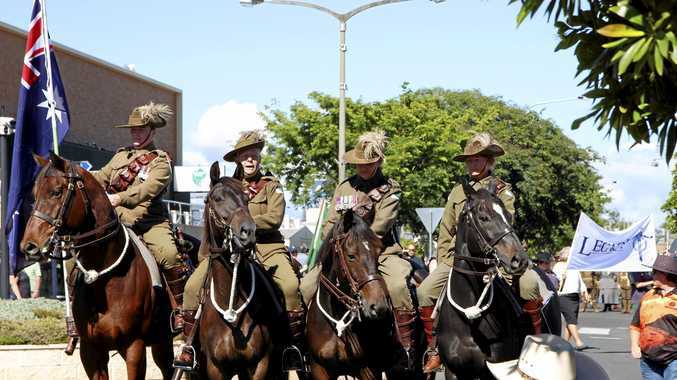 "They are exceedingly dangerous incidents when this occurs - you need to be vigilant."